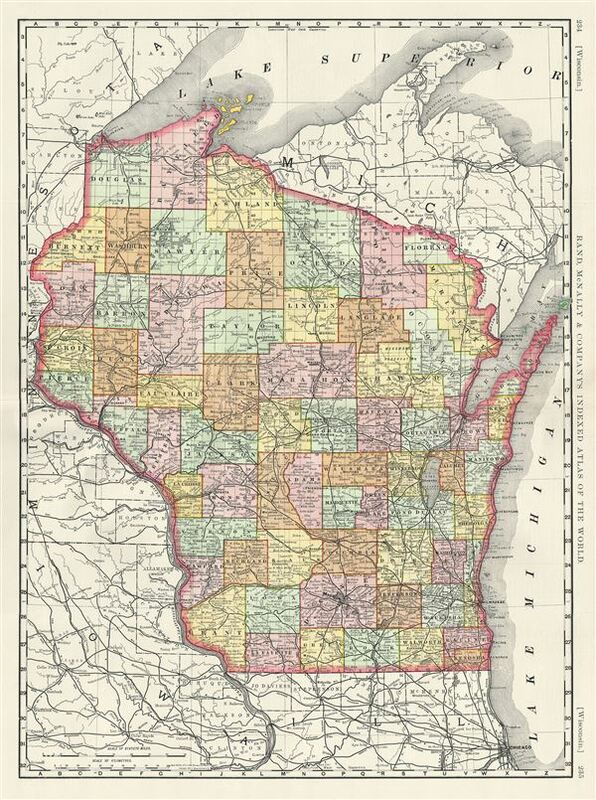 This is an attractive Rand McNally and Company's 1889 map of Wisconsin. It covers the entire state of Wisconsin bounded by on the north by Lake Superior, on the east by Lake Michigan and on the west by the Minnesota Territory. Parts of adjoining Michigan, Iowa and Illinois are also included. The map also delineates survey grids and plats referencing the work of the U.S. Land Survey. Several cities, towns, rivers, railroads and an assortment of additional topographical details are noted. The map is color coded according to counties with elevation rendered by hachure. This map was issued as plate nos. 234 and 235 in the 1893 edition of Rand McNally and Company's Indexed Atlas of the World- possibly the finest atlas Rand McNally ever issued.